Below is the link to the message I preached this weekend. God used the life of my son once again to lead people to a saving relationship with Jesus! There was great celebrating in heaven yesterday. I love you Trey! 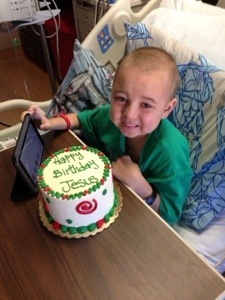 Last year Trey told Jesus happy birthday…this year he is with Him! We love you Trey…you are in our hearts buddy! I know you are having the best Christmas of all in heaven. See you soon my hero! 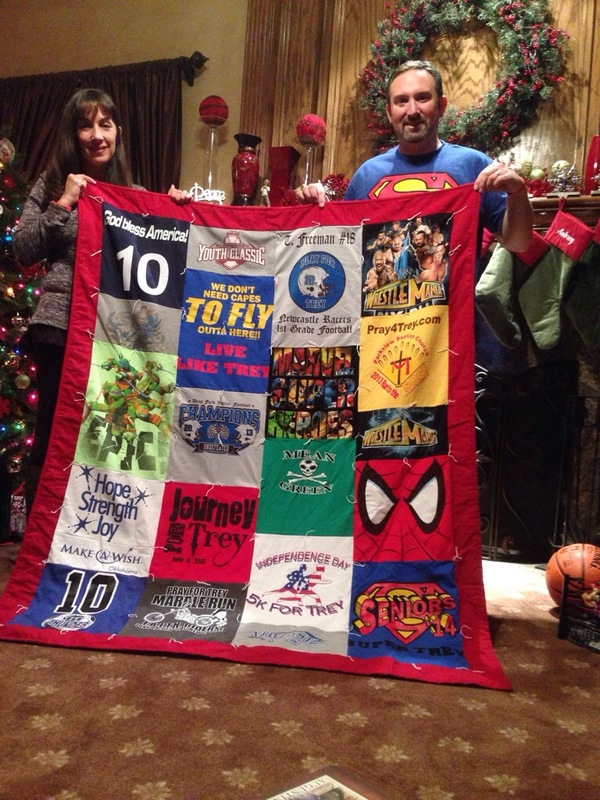 Amazingly special gift my wife had done for me…some of Trey’s favorite/special shirts put on a quilt. I so love this and will cherish it always. It also has a blanket on the back of the quilt of his little Einsteins blanket that he loved when he was really little. A huge thanks to the sewing women at Parkview Baptist Church in Tulsa who made this. This will be all I need for Christmas… and a dream about Trey wouldn’t hurt either. I love you buddy…you will always be my hero! During the Christmas season, you often hear people who are grumpy or stingy referred to as “Scrooge,” or if they have a negative spirit people might say, “bah humbug.” As Christians, there should never be any “Scrooge” or “bah humbug” in us at all. Christians ought to be the most gracious, joyous people on the planet. Why? Because we have the most to celebrate and be thankful for. We have the great God who has given us our great salvation through the one and only Savior of the world, Jesus Christ! Because of Christ, we have every reason to rejoice and be overwhelmed with gratitude in our hearts. Now, sadly, there are many “Christians” who do not walk with a sense of gratitude or generosity. There are many people who claim to be Christians who are constantly negative, angry, bitter, resentful, and even down right hateful. There is no excuse for such behavior. Now, in all fairness, Christians are not perfect, and we are all prone to times of sinful, fleshly attitudes. So, just because we are Christians does not mean we will not sin, rather, it means we strive to live like Christ, and when we fail, we admit it, repent of it, and get up and walk in the grace of God and keep going. However, what’s inexcusable is a bitter, unrepentant heart and spirit in a so-called believer who refuses to work on bad attitudes, habits and behavior. First, let’s talk about grace! Everything in the Christian life begins and ends with grace. When a person understands the depth of their depravity, and the immense grace that God has shown them through Jesus, their heart will be overwhelmed. It’s impossible to walk in pride when you think rightly about the Cross. When you understand what you deserve (death and hell) and what Jesus has done for you and given you (forgiveness, abundant life, eternity with Him)…you will be nothing but humbled in the greatest possible way. The most important step in avoiding a ‘bah humbug’ spirit is for Christians to remember who they are and what they have without Jesus, and then who they are and what they have with Jesus. The grace of God should be the driving force in every believer’s heart everyday. But what’s next? Well, when you walk in the grace of God, your sense of entitlement will be dropped and you will have a tremendous sense of gratitude in your heart. What’s needed in Christians today is a grateful, thankful heart…a heart full of gratitude. I run into so many people in the this life, and in the church, who live with a spirit of entitlement. They feel everyone owes them something. The reality is, when we walk in the truth of what Jesus has done for us, we will not even think about what we are owed or entitled to. Instead of looking for apologies, we will extend grace and forgiveness. Instead of thinking about how someone wronged us, we will want to show the grace to others that God has shown to us. Grace leads to gratitude…mark it down! Flowing from gratitude comes gentleness. When we properly understand grace and have a gratuitous heart, we will see people how the Lord did…with compassion. A gentle and meek spirit is needed in this world today. No, this does not mean you will let people walk all over you, or that you should not boldly stand for truth or your convictions…what it means is that you will see people correctly and relate to them as Jesus did. What Jesus was most interested in, was the heart, and when grace permeates our hearts we will be grateful, gentle people. If you do not see people correctly, you will never touch their heart or minister to them as God would have you to. This leads to the next point though. From grace to gratitude…from gratitude to gentleness…and from gentleness to generosity! God’s Word prizes cheerful giving. As the Bible says, “It is more blessed to give than to receive.” However, true generosity begins from within…from the heart. Hard hearted people do not help others because they do not see others correctly…and they don’t see others correctly because their heart is not immersed in grace and gratitude. Generosity flows from a thankful, grateful, grace saturated heart that longs to truly meet needs and help others. Someone once said, “Your money goes where your heart is.” Christians should be the most generous people on the planet…not looking to store up, but to give away. Finally, what does generosity lead to? Genuine joy!!! There is great joy in serving, ministering, and giving to others. Grace leads to gratitude. Gratitude to gentleness. Gentleness to generosity. Generosity to Genuine joy. This is why Christians should be the most joyous people alive…why? Because we understand what life is all about. And what is this life about? The life to come…eternal life. If you meet an angry, bitter, resentful person, know this, that person obviously does not understand grace, and therefore is not thankful, but rather full of selfish entitlement. They don’t care about others, but only themselves, and therefore they do not look to bless, but to be blessed. When a person lives like that, they will be bitter because no matter what anyone gives them, it will never be enough. They will always think they deserve more. What they most need is to be touched in the deepest part of their heart by the grace of God…which may be best shown through the life of a genuine Christian who walks in God’s grace, has a genuine gratuitous spirit, is gentle with others, generous with all they have, and thus walks in genuine joy. Christians who live like that will always make much of Jesus and their words and life will point to Him. May that be true of all believers…especially this Christmas season. Why? Because Christ has come! The Light has dispelled the darkness! Hope has arrived! Jesus is Lord of all!!! Amen and amen!!! I will end with the words of this great song called: Let them see You in me! Say the words You need to say? Who am I without Your grace? I’m sitting here thinking about the power of hope tonight. Hope is perhaps one of God’s greatest gifts to His children. I know of many people tonight, myself included, that need to be reminded of the blessed hope we have in Christ. For the widow missing her loved one, the parents longing for their prodigal to come home, the one awaiting test results, the person who has lost their job, those grieving deeply over loss, and on and on…let us all remember, THERE IS HOPE!!! As long as Jesus is Lord, there is hope! Did you see it? Hope does not disappoint us! Why? Because the love of God has been poured into our hearts!!! I’m just reminded tonight, and I’m sure someone else needs this reminder too, that because God is alive and active and because Jesus has conquered all things…THERE IS HOPE! So, wherever you are and whatever you are facing, don’t give up. Remember, look to Jesus, for He is HOPE and He gives HOPE!! !